An artist-led initiative that builds partnership with Worcester City Council (Heritage & Design Team) and University of Worcester (Humanities & Creative Arts). With David Patten and Stuart Mugridge. Meshwork Worcester was an artist-led initiative that built partnership with Worcester City Council (Heritage & Design Team) and the University of Worcester (Humanities & Creative Arts). The first phase of Meshwork Worcester aimed at investing artist thinking (R&D, action research, and infrastructure building) in the period between public consultation on A Master Plan for Worcester (David Lock Associates, 2011) and in advance of the publication of the Coalition Government's new National Planning Policy Framework. 'Meshwork Worcester' was with Stuart Mugridge and David Patten working in response to the thinking of social anthropologist Tim Ingold, in particular his notions of 'taskscape' and 'meshwork' and Stephen Wright's identification of the potential of the artist 'of extraterritorial reciprocity'. I began researching as part of the Meshwork team, to understand how artists, enginners and architects had contributed to the city over time, and how we might interpret their ethos to encourage and inform future city-building aspirations. In addition to this and to support the other' research I examined and cherry-picked from everything we saw relevant: the recent Masterplan; our archive research and developing narrative; planning guidance; public art policy and strategy; successful schemes; and even international and national aspirations in things like Water Sensitive Urban Design (as Worcester floods quite regularly). From this and other work, we gained a sense of direction and common purpose. In response to the masterplan, the city council had begun to develop ideas regarding four sites across the City that would be intrumental in creating a better East-West axis. I began by researching one particular site [St Clement's Gate] and this also became a later focus for the team. We created many drawings that both challenged council plans and enriched them with content. 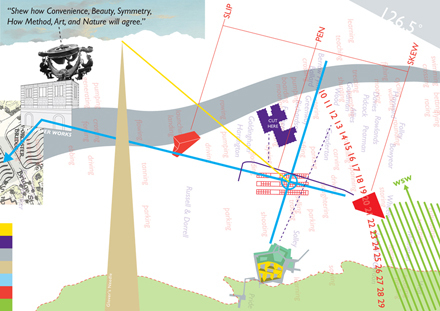 We produced poetic text in conjunction with documented investigations of the site and proposed ways to activate the sites with events in connecton with others. To initiate these connections, we devised two events linked to 'Space-place' and 'Composting Culture' confererences that were being led by the University of Worcester. Both times, myself and Stuart Mugridge led delegates in conversations about the city, framed by specific and past creative city-building contributions and discussed the identity and future of the site. Talking to art lecturers and students also aimed to build interest and involvement. From these type of explorations and activity, we saw how artist-activity might challenge the defensive thinking about the city's flood plain  and visually demonstrate Worcester's cultural well-being. We also initiated proposals of a place-lab  that could be more proactive than the City's public art panel. John Gwynn's "Shew how Convenience, Beauty, Symmetry, How Method, Art, and Nature will agree"
Pearmain and alder become dotted with the plum accents of Octar Copson's brush. The PAG creation was also directly linked to the council's intentions for mechanisms to fund art in the future . Research was also undertaken into past 'town artist' models in the UK. With the aim to reclaim the Cornmarket as a focal space for the city, Meshwork Worcester put theory into practice by being commissioned to create a 'Workable Diagram': a 26 page artist-led document that contributed a further layer to the vision set out in the Worcester City Masterplan Vision (July 2010). 'Art-working' included archive reasearch; on-site investigation; drawings of site geometries and the wider relationship to the City's East West Axis proposals; sun path simulations; colour palettes, proposed layouts and ways to support and activate flexible public space. Meshwork Worcester provided key proposals for lighting, sound and the creation of an permanent 'estrade'-or stage on the footprint of Worcester's lost Public Hall. 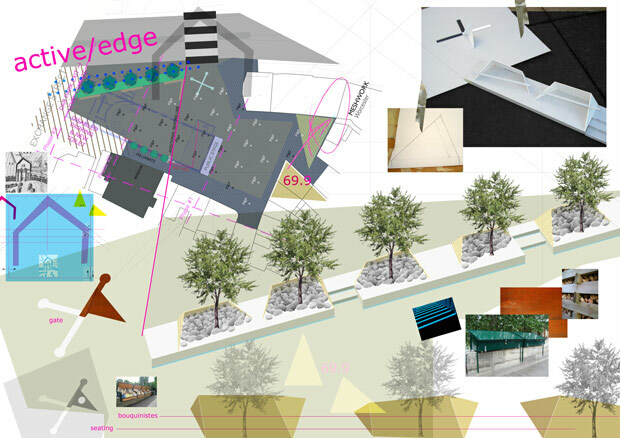 In addition to the this I was heavily involved in ideas for an 'active edge' that could give a sense of enclosure to the square and substance to the line of the lost city wall and Watercourse Alley. Along with tree planting and sculptural elements, the active edge would harness city-performative elements of seating and particular small market plots that wouldn't compete with other market arrangements in the city. Rather than see a statue of Worcester-famous 'Vesta Tilly' being placed at this site because of her strong conection to the Public Hall, we saw her performance eccentricities and humour begin to shape the ethos and delivery of a programme of meaningful 'participation as consultation' events. These would input into the design and programming of the Cornmarket through on-site experimentation. We contested that her influence could see the square as city-building event, rather than just an object included in an "isolated patterning of landscape materials and pedestrian/vehicular movements". The proposed activation of a currently redundant on-site building 'The Screenhouse' by Worcester Univesity that could, amongst other uses, investigate the notion that Worcester comes alive when it floods. The City Council's Heritage & Design Team aimed to implement a pooling mechanism of funds from Section 106 agreements and potentially Community Infrastructure Levy.